Yesterday again I warned to be cautious and even to stay away from the market. Intraday trading was about OK in the morning but prone to execution problems. What can we expect for tuesday? 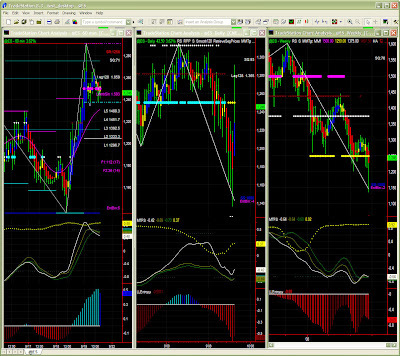 ES: prices found some support on 1125, the MM level even if penetrated, can be regarded as holding. Having said that, it is clear that a LOT of uncertainty remains in the market and a lower bottom is possible (1070?). After yesterday's shock, a technical bounce is likely even if not visible yet. ER: Same - Despite the bloodshed, it seems there is also a support level here (656 on MM, 645 Fib), and also a lower stronger level at 625. Again, I recommend staying on the side line until volatility comes back from stratosphere. Yesterday's general comments are still valid, i.e. shorter time frames are recommended as our visibility of 3 to 5 bars may sometimes be reduced in times of high volatility even if the outlook is overall correct. For instance, if we analyse yesterday's movements on ES, charts expressed an upward movement (strong open), yet the first 60mins bar closed around the upper boundary of our price segment (~1205), we then saw an excursion all day to the top of the price segment above to even reach the mid 1220s. ES closed lower and even lost about all gains in post market trading. This is typical of a high volatility environment, but this warning should not affect our outlook overall. The general market dynamics stay the same. 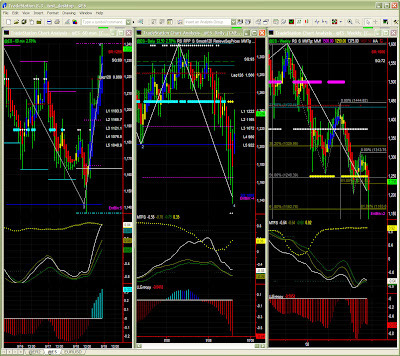 EURUSD: We spent the day on shorter time frames where we watched the 1.464 level being tested over and over. We updated our support to the 1.4557 MM stall level very close to yesterday's lows. The bounce brought the €/$ more or less where it previously was and we now expect much of the same today with a slight upper bias. ER: Not much movement here. ER tried to move to a higher price segment, but closed the day hovering at the boundary (~704), and sank in post market. We therefore expect a continuation of the same drifting situation and anticipate the market to test a strong support level. At the moment we canonly hope 688 will be that one. Again, it will take a long time to digest the current volatility. ES: Same situation with the same ongoing drifting looking for a support level (1188 for now), and hoping for volatility to subside at these time frames. The hangover period is probably going to be very very long and we again recommend moving to lower time frames or stay on the side line for now. Due to the current volatility and uncertainty of the market, i shall post a few more quick reports on the public blog. Please contact me still for other symbols. EURUSD: After testing 1.464 all morning to a very soft response, the market decided to look for a support on 1.46. Again, no surprise but did we get the extra push to reach 1.495. Not sure in the short term, but we'll get there eventually. At this time frame as well as daily, we'll keep our UP bias. ER: What will stop this endless drifting? The market decided to test another price segment and we're now on our way to 688. The good thing is that this support level is significantly stronger, but the downside is that there is no sign of a bounce yet. That's good for our options condor anyway, so we won't complain. ES: The shock we had last week impacted ES more than the larger market, and it appears that while ER tried to catch up yesterday, a support around 1188 (same segment) is holding. A technical bounce is quite possible here but like ER one should not build undue expectations in the short term. ES should stay in the same price segment (<1204), and 1219 looks very strong. We need to sort out access to ICE to keep our charts up. Sorry for the inconvenience. Note: despite being hit by vega, our October options position remains unchanged. I've already commented this crazy week on a day by day basis. This was certainly the only way to sail through the storm. 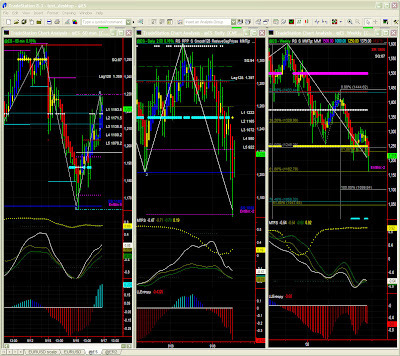 You'll notice that it is also in line with our significance level, favouring either the weekly chart or the 60mins one. Now let's see what's in store for monday. I shall comment the market on a daily basis on this blog until volatility settles a bit. EURUSD: Last week's report was quite correct overall. Obviously we've had a few interesting swings on the 60mins chart, but since this weekly report focuses on the daily chart over the next few days, we here see a resistance level around 1.453 then 1.464. We have no indication of further gains even if there are concerns that the Fed & Treasury emergency plan will cost so much that it should ultimately weigh on the US currency. Let's not come back on this wild rally and just focus on volatility which will remain VERY high for at 2 days. Prices should technically also settle on the first Fib retracement level and tease the 1250 level, but it is not possible to fully anticipate the effects of the 10-day ban on short-selling. From a pure dynamics point of view, 1250 remains a crucial pivot level. ES could retrace 1 or 2 segments (i.e. to 1234 or 1219), and will need to pass and test 1250 as support to engage into a bullish trend. What happened last week is clearly a spike at this level. Last week's caution warning is still valid as the model must digest the spike over a few days. We'll revert to the 60 mins chart, which displays a higher significance level anyway. Here again, i warned of lower lows, and the advice was certainly 'spot-on'. Despite the formidable recovery on Friday, the current trend remains still down technically, and again the 1250 level is key to forthcoming market direction. Obviously new market regulations on short-selling could allow ES to pass 1250 etc, yet if one just reads the chart as it is, more time and effort will be necessary to dissipate a lot of negative pressure still accumulated overt time. ER: After the initial shock, ER is now staying in the 705-719 segment, yet, while energy is subsiding, there is still substantial downward pressure. We'll have to watch whether 705 holds. The segment below (support around 690) is a safer bet. 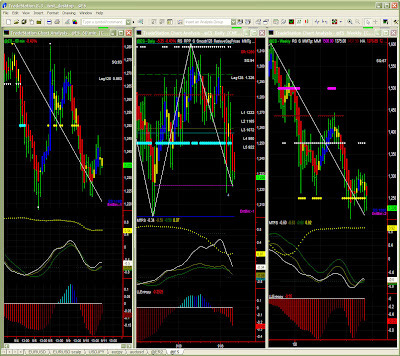 EURUSD: a retracement to above 1.44 was expected, almost awaited, but it certainly came extremely suddenly. 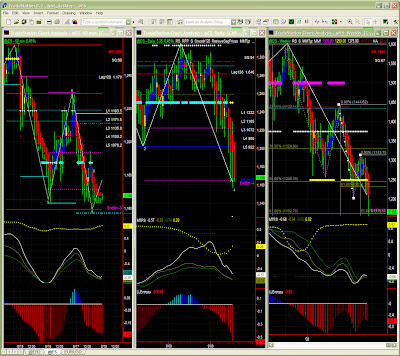 There is still some retracement potential but things are likely to calm down first just above pivot level. Please also always read ER2 post below for guidance. Another week of a fall then a recovery, hard to follow on a daily chart, but OK on a 60mins chart or below. Again we look at the market in clear segments (see last week's posts) to better understand price jumps. We're now trying to pass the 1250 level again, a level which has lost its significance now, at least until it is again firmly tested as support. This remains to be seen. Again, maybe repeating myself, we have to wait for a confirmation of prices staying above pivot level. MTFS is relatively bullish, even if Entropy seems to be losing steam already. 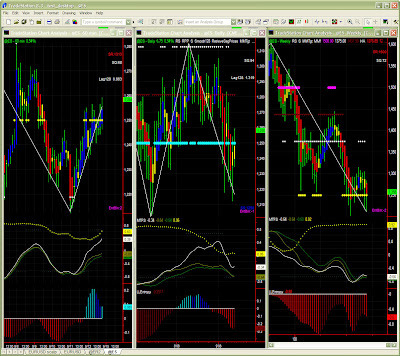 One may want to study shorter time frames, as well as correlation to bonds and forex. We should know within the first few bars of the day if ES stays above 1250 i.e. evolves within the 1250-1281 segment. significance level has dropped for a while at this TF, so the more conservative will have switched to a higher or sometimes lower TF, or stay on the sideline for a while. Current recovery still looks quite unconvicing, so its potential may be limited at first. Congestion and a clearer testing of the 1250 level would be needed to take prices higher. We'll remain very cautious in the short term. Summer recovery is over and failure to pass 1300 will force the market to find a reliable support level. The MTFS crossover right now comes with line gradients indicating that support may be lower than 1250, maybe near recent lows. We'll therefore watch shorter time frames carefully until MTFS and Entropy both look healthier. Options (RUT): September positions will die gracefully now. For October, no change: call options are placed above 875 for 100% safety otherwise 810 is very safe. I personally think 790 is more than safe enough. Puts below 680 to me are technically safe but could cost too mush if market falls further, so should safely stay below the 625 line. 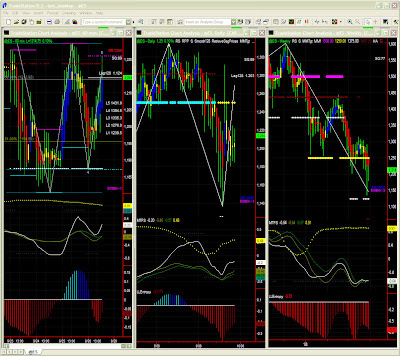 Last week post tried to show the dynamics of price jumps with possible expectations around salient resistance levels. It's like watching pole vault at the olympics. Again the 750 level proved too high, the good thing being that we realised it immediately monday morning. The mid week update was more that necessary in these times of high short term uncertainty. EURUSD: The US$ hit our target almost spot on (we have a [1.393-1.391] target range) as mentioned in our daily market report and I also gave indication of the following bounce with a first target to above 1.404 which was then passed. 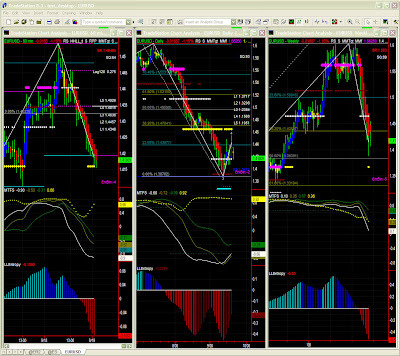 We're probably now on our way to the much awaited Fib retracement (see chart). We have a target now just above Friday's highs (1.4235), or possibly a little higher (just above 1.435). The possibility of a full retracement to ~1.47 is very remote at this stage. Energy is not conducive to thinking this is more than a short term technical retracement at this stage. We've seen 705 acting as a strong support to the high end of that price segment around 719, but it is still difficult to say whether it is ready to jump to the higher segment to 735, and 750 looks even more remote. We are therefore more likely to see a congestion period with prices possibly drifting again. Shall we see ER test the pivot level to go higher or go lower, test it as as resistance to then reach lows again...? That's what a pivot level is all about so we'll eventually follow a lower time frame for that purpose. Last week's post expressed how unconvincingly ER was approaching 750, so the rest of the week was almost no surprise. Now despite seeing good looking bounces on 705, it seems drifting could continue, at least to 705 again (also a Fib level) or even around 690 (MM+Fib). 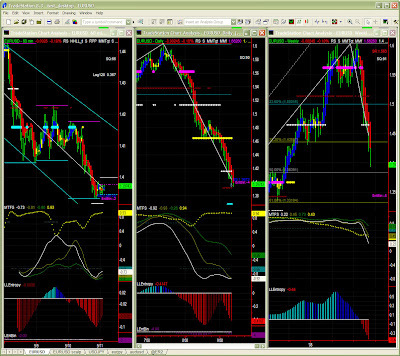 Obviously we'll watch the 60mins chart first in case we stay above the 719 line, to me unlikely to hold. Again, one could almost just paste last week's post. 750 proved too strong and sellers are now trying to push the market into another cycle it seems. 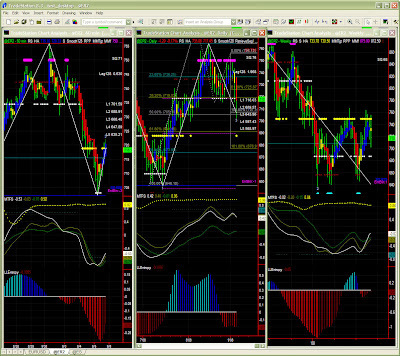 Yet, one should not fall into bearish thinking too quickly. There is a high volatility at the moment, but it is a matter of a little patience until we see energy aligning itself i.e. chaos settling a bit. 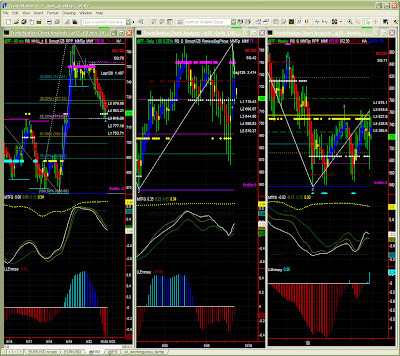 Again we'll watch lower time frames carefully to determine market direction maybe next week or the week after. We could indeed still see ER testing range boundary to that difficult breakout to the 780s... or of course, buyers giving up until we hit this year's lows again. Fortunately that scenario still looks less likely to happen. EURUSD: we now see some stabilisation above 1.41 in the short term, but 1.391 to 1.393 remains our target over the next few days. Obviously we have a well defined channel on the 60 mins chart, and prices could test the upper boundary too, without affecting our mid term scenario. 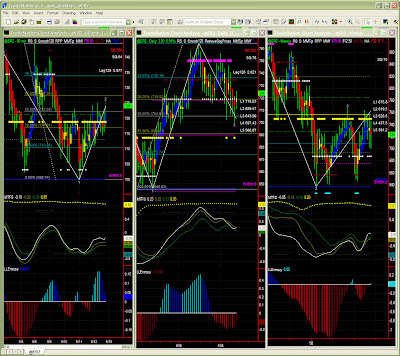 Indices: I warned of high volatility, congestion with a very limited recovery potential. Prices will have to test lows as a support level now on ES. We also do clearly notice that prices jumped to the exact lower segment [1219-1250] with the lower boundary holding for now. Such level is also a Fib target level. Certainly not out of the woods yet, but we'll keep an eye on this potential support level. ER2 follows the same route with a potential support level around 705. Another roller-coaster week yet again which can have been costly to some as one should either trade on the dominant time frame or just hang on until volatility settles now. You will have noticed that the price segment analysis will have helped with abandonding the 1281 level to try 1250 then 1220 in clear 30 to 31 points gaps. 1281 remains an important level going forward. In times of high volatility, following movements on this shorter time frame looks easier at first, but in fact, moving to even lower TFs is recommended keeping this 60mins as the context TF. 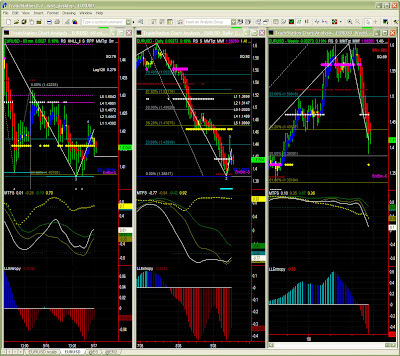 We'll watch resistance levels (Fib/MM) and where prices now settle. There may be a number of adjustments and arbitrages in the next couple of days (we'll keep a close eye on EURUSD and bonds this week). We see a recovery to the 1270-1281 area, but we certainly need volatility to subside a bit to determine a clearer direction. ES may therefore congest for a while in this price segment or the one above. Now that we've seen support holding, we have been looking for a recovery potential, but it appears it will start on a very slow note. Ou MTFS crossover does not point to any convincing recovery. A congestion or limited upper bias remains our favourite scenario for the time being. Options (RUT): September/October call options are placed above 875 for 100% safety otherwise 810 is very safe. I personally think 790 is more than safe enough (strong res at 782) for Sep expiry (less than 10 days). Last week post indicated a pause, and the mid week update clearly announced the effect of an "air pocket" which is certainly an adequate picture for the turbulences we've seen late in the week. Having said that, looking at our charts, no reason to worry... those things happen and we just have to tighten our seat belts for a while. EURUSD: we reached our 1.435 target, even a little quicker than anticipated. The $ even hit just below 1.42 but 1.435 is really a strong test level for now. A retracement would certainly make some sense, but in the meantime we'll again go with the flow. 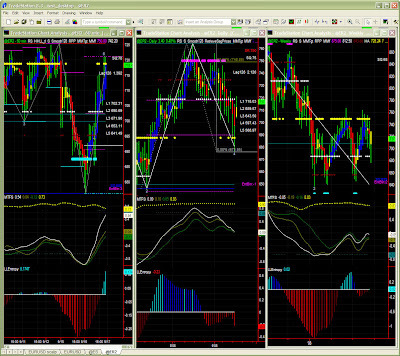 The next target is in the 1.367 to 1.383 area still looks some distance away. Ready to pick up again after a sizeable retracement on major 750 level in the form of a quick Fib pattern prices right down to the 700s. Traders should now preferably switch to another set of time frames either lower or higher to take advantage of the current market conditions. We might now see prices hover around the same area and probably pass the 750 level. We have a Fib target around 773 now in sight. Yet, the market may again also calm down on a salient level until the latest news are fully digested and priced in. In all probability, we have 2 price segments: one is [719-750] and [750-782] both being possibly also cut into 2 equal halves. 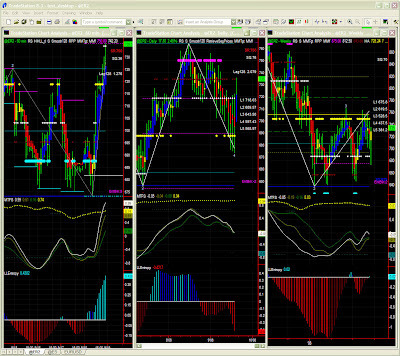 We'll therefore watch price jumps and settlements in such or such area according to energy now coming to the market. At this time i.e. prior to the open on Monday, we have no visibility of a jump above the 750 level just yet. Again, no change (simple copy&paste) from last week. We're now again testing range boundary to a possible yet difficult breakout to the 780s. Again, we've no or little support from Entropy or MTFS to suggest more than a summer recovery with no underlying strength to take prices higher for now. There's even some 'frustration' not to have seen a clear MTFS pattern completion, but the adaptive indicator may still evolve later on. 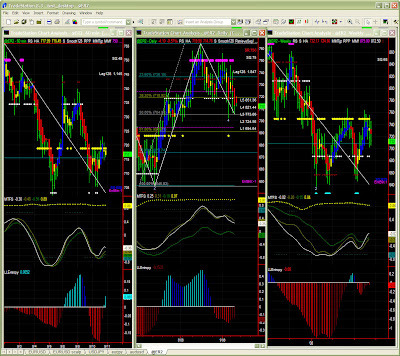 We therefore have to wait a bit still for a clearer scenario for 4th quarter. Note: we do have a MTFS crossover to monitor, even if not in ideal situation. ER2: behaving as expected, testing of strong resistance came early after long weekend. Same outlook now with possible congestion/volatility in the upper part of the [734-750] range. Ultimately ER2 will try and hit the resistance again, but we are seeing now a "air pocket" formation hence a stall with prices to a stronger support level. Again, prices generally stay in clear "altitude levels" where an equilibrium is found. In this case, we'll keep in mind that there is a stronger base at the bottom of the [688-734] range. This is however only background info for the time being, which we will review in more details next week. ES: Same "air pocket" interpretation, with here again a stronger base or support much needed. No worry over the long term but profits can certainly be locked in the meantime. 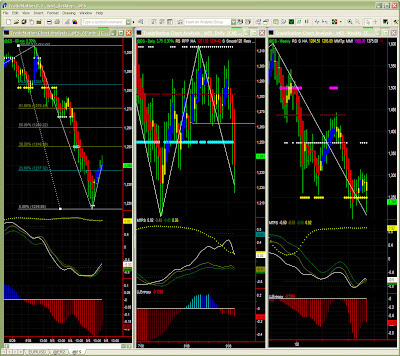 EURUSD: Now that 1.46484 is broken, we are looking at 1.44043 then 1.43587 as our next targets. 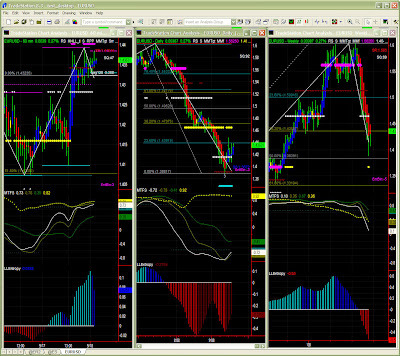 Our calculated stall level came only 2 ticks away from yesterday's low! It can still slow down the fall today. Yet, it seems we won't see a significant bounce before we hit our first or 2nd target. Although charts have been very easy to read so far, i am certainly personally amazed by the resilience of the US$, which we can attribute to fall in commodities prices. Net creditors of US debt are smiling again after a period of uncertainty.